August is the month of the world famous Kandy Perahera. It climaxes this year on the Full Moon day of Tuesday 20 August with the evening parade of whip crackers, fire dancers, jugglers and elephants, including one bearing a casket containing the revered Buddha’s tooth (or a replica of it). In 1592, the sacred tooth relic (that had arrived in the island in AD331) was brought to Kandy. 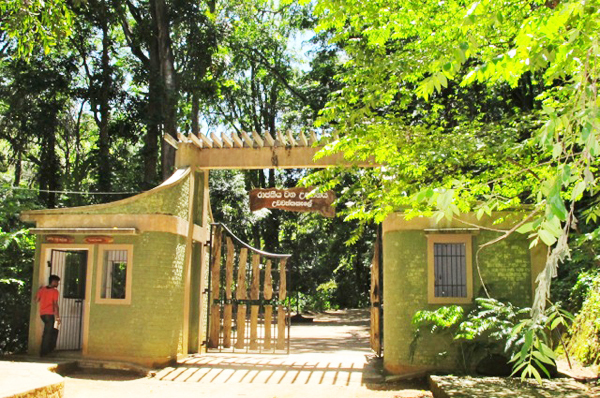 Its presence confirmed Kandy as the capital of the island, in spite of the presence of the Portuguese on the littoral. In 1658, when the Portuguese were ousted by the Dutch, the kingdom was able to co-exit, albeit uneasily, with the new occupiers. The British, however, wanted the island in its entirety and conquered Kandy in 1815. Signs of the British presence can still be seen in colonial buildings. 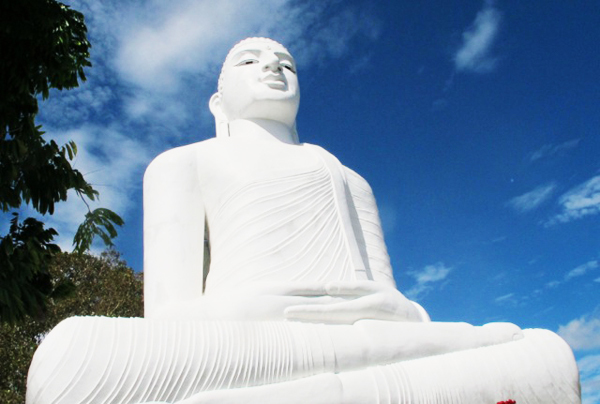 While the Temple of the Tooth is on the itinerary of every visitor to Kandy, many only have time for a day trip there. It’s possible. I started at the Travel Information Centre in the Kandy City Centre, a new air-conditioned shopping mall in the main street, Dalada Veediya, a 10-minute walk into town from the railway station. There a young lady with a winsome smile of welcome that seems typical of young Kandyan belles, spoke enthusiastically of all I could see in one day. She marked the sights, opening times and admission prices on a street map and, armed with this, I set off. It was a short walk up Dalada Veediya to the embankment surrounding Kandy’s king-made lake. I declined an offer of a 20-minute boat trip around the lake for Rs2,500 and instead paid Rs1,000 entrance fee to visit the Temple of the Tooth. On leaving the temple, I turned right then right again up the road running parallel to the temple park and was confronted by the extraordinary sight of The Prince of Wales Fountain. 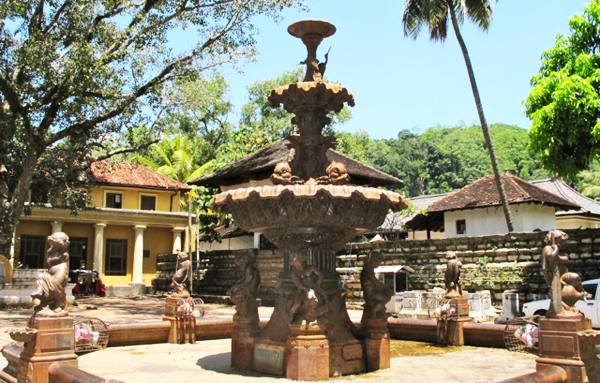 Rich in Rococo cherubs, some of which have lost their heads, and floundering cast iron fish, this was erected ‘by the coffee planters of Ceylon’ to commemorate the visit to Kandy of the Prince of Wales in 1875. No longer majestic, and no longer spouting water, it remains a tribute to the Victorian foundry man’s art. Close to it along the Deva Veedya is another steadfast reminder of the British presence, St Paul’s Church built in 1846. Some 200m from the church is the Garrison Cemetery, containing graves of 19th century Britons, including Sir John Doyly, a pioneering British government official who learned and spoke Sinhalese fluently. The cemetery borders the Udawattakele Royal Forest Sanctuary but since it would take a long time to walk uphill to its entrance, I took a three-wheeler. This patch of tropical rain forest surviving from when it was part of the Royal Palace complex, is delightfully lush and a contrast to the heat of the city. Admission was Rs622, and I longed to linger longer. However, there was much more to see. The young lady at the tourist office had recommended a walk to the site of the Bahirawakanda Buddha Statue that overlooks the town. Instead I took another three-wheeler (Rs600 there and back) as the climb up narrow roads would probably have taken me the whole day. The statue exudes an air of peace and commands a magnificent view of the town, the lake and the golden dome of the Temple of the Tooth. Back to town for lunch, at The Royal Bar & Hotel, a licensed tavern since 1860 and now stylishly modernised with no hint of boutique snobbery. 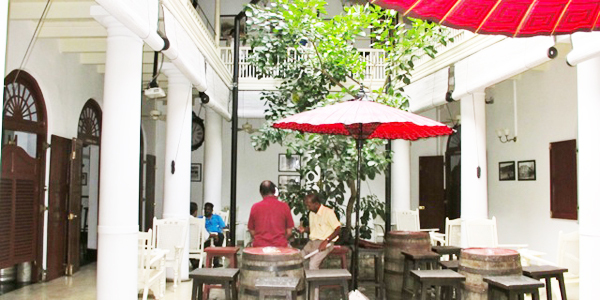 It has a public bar with a black & white tiled floor and a teak and mirror display cabinet, a first floor restaurant with a 1930s ambience and a cobbled courtyard café. The charm of the place is its mix of clientele; Kandyans popping in for a quick snifter and chat with friends, expat residents gossiping and tourists gaping at the memorabilia and welcome friendliness of the ambience. 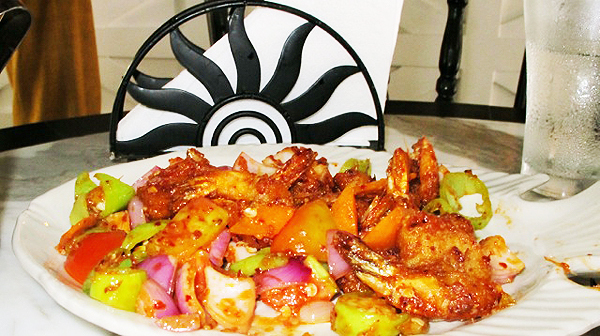 After lunch of spicy prawns, Rs600 [£ 3] I hit the shops. On the way back to the railway station, I was delighted to discover, where a fountain spouts underneath the roundabout at the end of Dalada Veediya, underground kiosks selling saris and souvenirs. Scraped from the bark of the cinnamon tree, shaped and dried into quills, cinnamon was one of the spices that attracted the Portuguese to Sri Lanka. Although its export is no longer a prime income earner, cinnamon is still grown in Sri Lanka where it is a prime ingredient in Sri Lankan cuisine. 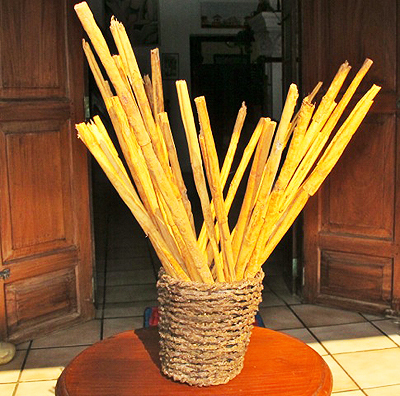 At home, I use a bunch of cinnamon quills as a table decoration, seen here in a basket made from dried creepers fashioned from the kithul palm tree. I bought that for Rs440 [£ 2.20] from the famous Paradise Road emporium of cute things in Colombo. The quills came from a cinnamon peeler on the west coast and cost the equivalent of £5. Apart from its decorative statement it’s attractive for the faint aroma that wafts around the parlour. I have noticed, though, that the quills are getting shorter, as my houseboy has taken to breaking off and nibbling a piece occasionally. It’s surprisingly sweet. 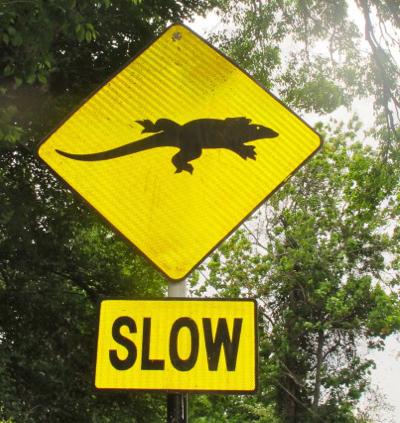 Just as the way people drive in Sri Lanka can seem crazy to those used to British or European standards, the road signs here are equally bizarre. 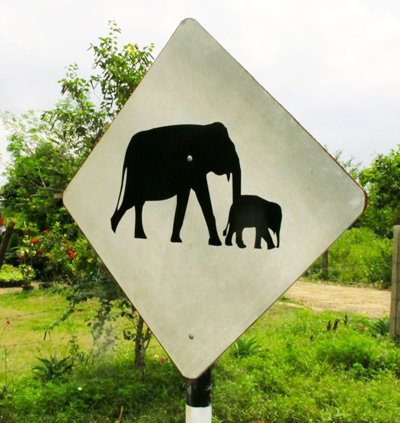 I saw these two on a recent road trip, warning of elephants and iguanas crossing. 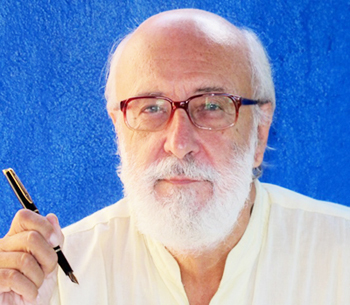 British travel writer, novelist and beat poet, Royston Ellis, is author of The Bradt Guide to Sri Lanka.